Canada: NDP Supporting “Terrorist-Linked” White Helmets for Nobel Prize is a Serious Mistake! The backlash against this move by the New Democratic Party has caused a few tidal waves. The following is an open letter written by John Ryan, Ph.D., Retired Professor of Geography and Senior Scholar at the University of Winnipeg. 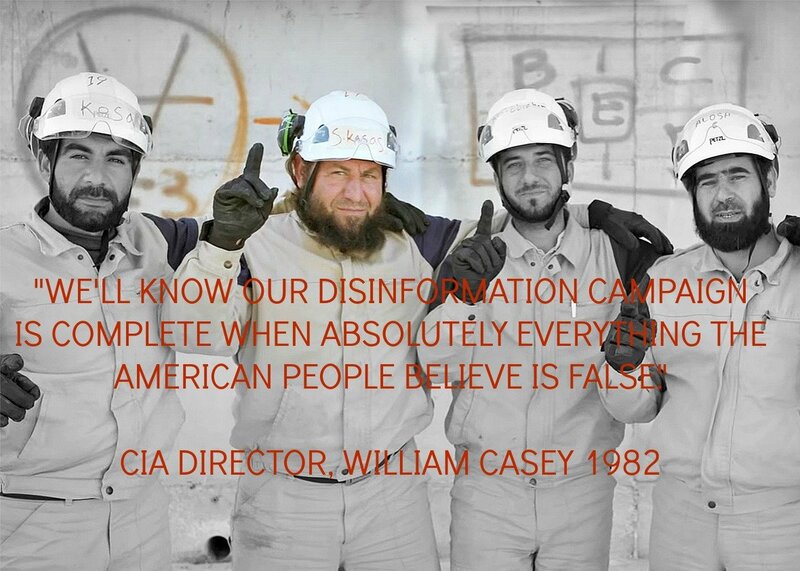 Nevertheless, instead of simply relying on the mainstream media for information on this issue, you should have assigned someone to do in depth research on what the White Helmets entity really is. This is a complicated matter, and my research on this has resulted in a rather lengthy letter, but it’s critically important for you to know what is involved. My research shows that the White Helmets do not operate in all of Syria but solely in Al Qaeda and other terrorist occupied parts of Syria. The question arises that if the White Helmets are supposedly not affiliated with any political party and that they are devoted to saving the lives of Syrian people wherever they are, how is it that they are found only in Al Qaeda and Al Nusra occupied parts of Syria, especially in the terrorist-occupied sections of Aleppo? When these terrorist groups shell and bomb Syrian government controlled areas, how is it that there are no While Helmets to help the people in these areas? After all, it is the terrorists who are responsible for the bulk of the casualties. “While the compliant American press parrots the narrative that our military support for the Syrian insurgency is purely humanitarian, many Arabs see the present crisis as just another proxy war over pipelines and geopolitics. Before rushing deeper into the conflagration, it would be wise for us to consider the abundant facts supporting that perspective. In their view, our war against Bashar Assad did not begin with the peaceful civil protests of the Arab Spring in 2011. Instead it began in 2000, when Qatar proposed to construct a $10 billion, 1,500 kilometer pipeline through Saudi Arabia, Jordan, Syria and Turkey. . . . Secret cables and reports by the U.S., Saudi and Israeli intelligence agencies indicate that the moment Assad rejected the Qatari pipeline, military and intelligence planners quickly arrived at the consensus that fomenting a Sunni uprising in Syria to overthrow the uncooperative Bashar Assad was a feasible path to achieving the shared objective of completing the Qatar/Turkey gas link. The Syrian war has been raging since 2011, leading to the deaths of an estimated 400,000 people, according to UN estimates. As Kennedy pointed out in his article, the conflict began when the US-backed opposition started an armed rebellion against President Assad’s government. Although this is regularly portrayed as a “civil war,” it is nothing of the kind. The US State Department has recently admitted that “an excess of 40,000 total foreign fighters have gone to the conflict [in Syria] from over 100 countries. The war has been funded by billions of dollars, primarily by Saudi Arabia and Qatar, and indirectly by the USA through its on-going CIA operations that provide military training and the latest weapons, including artillery and anti-tank guns. So where do the White Helmets fit into this scenario? Our media portrays them as a group of Syrians volunteering as emergency first responders who scour through rubble in Syria after bombings to find survivors. They claim to be not affiliated with any political party and describe themselves as “neutral, impartial and humanitarian.” But if that is so, how is it that they do not operate anywhere in Syria except in areas held by Al Qaida forces, primarily in the Al Nusra occupied areas? The media openly admits that they “respond in the aftermath of Syrian government aerial bombings.” So where would this be other than in rebel/terrorist-occupied parts of Syria that the Syrian army is trying to recapture? If that is the case, how can be they claim to be “neutral, impartial and humanitarian” when they operate only in their so-called “liberated areas”? It is a myth, and actually a lie, that somehow all on their own Syrian civilians such as construction workers, blacksmiths, bakers, tailors, painters, students, teachers, voluntarily came together, in the thousands, to form the White Helmet brigades. They are portrayed as a “non-governmental” organization, i.e., an NGO, but it is on record that so far they have received $23 million from the US Government, $29 million (£19.7 million) from the UK Government, and $4.5 million (€4 million) from the Dutch Government. In addition, they receive material assistance and training, funded and run by a variety of other EU nations. This totals at least $60 million, so the White Helmets are not some poor unorganized locally based charity group. And are we to believe that all this money is used to just “scour through rubble” to try to rescue civilians in shelled and bombed war zones? How could all this money be used just for this purpose? There has to be something more to this. If the White Helmets devoted their activities solely to save the lives of people caught up in war zones, that would be commendable and beyond reproach, but that is not the case. A major part of their activities are devoted to media reports and public relations, and it seems that this is what accounts for a major part of their funding – and it appears that this is the primary reason for their creation. This highly questionable barrage of consistently defamatory material is nothing more than outright propaganda. The White Helmets is clearly a public relations project which has received glowing publicity from HuffPo to Nicholas Kristof at the NYT. White Helmets have been heavily promoted by the U.S. Institute of Peace (U.S.IP) whose leader began a press conference by declaring “U.S.IP has been working for the Syrian Revolution from the beginning”. A further disturbing aspect is the revelation of an Al Nusra video in which one of their members in Aleppo executes a civilian on May 5, 2015. Moments after the execution, several White Helmets appear on the scene to remove the body in a body bag. Afterwards the White Helmets had to respond to valid accusations of collusion, which they denied but it does show some type of symbiosis between the White Helmets and the “rebel” terrorist operatives. Shortly afterwards the video was deleted by YouTube. However, it was somehow saved and can be viewed on this site: An account of this has been presented by British journalist Vanessa Beeley in which she included four photos from the Al Nusra video, showing the execution and members of the White Helmets picking up the body. On their official website the White Helmets claim that they “have risked sniper fire to rescue SAA [Syrian Arab Army] bodies to give them a proper burial.” Contrary to this, however, one of the videos shows a senior member of the White Helmets describing the “throwing of Shabiha bodies in the trash”. Shabiha is a derogatory term used by the “rebel alliance” of Al Nusra/Al Qaeda forces for any member of the Syrian military, irrespective of whether they are Alawite, Sunni, or Shia. It is revealing how a supposed “neutral” White Helmet would use this derogatory term for dead Syrian soldiers. Another video shows several White Helmet members standing on a heap of discarded dead bodies of Syrian soldiers and giving the victory sign. And still another video shows “neutral” White Helmets once again flash the victory sign as they cart off dead Syrian Army corpses, perhaps be thrown in the trash. This display of support for the Al Nusra extremist terrorists who have just massacred these soldiers demonstrates where their true allegiances lie. The White Helmets venture, promoted by the entire mainstream media, has been amazingly effective. The most recent effort has been the Netflix “White Helmet” documentary that premiered on September 16 at the Toronto International Film Festival. It appears to be essentially a promotion video with the “Kid rescued from rubble” as the standard shtick. After the hideous murder of British MP, Jo Cox, a special fund was established to raise money for three of her causes, one being the White Helmets. Seeing that this was done within hours of her death it seems to be a cynical and obscene exploitation of her murder to try to maintain the credibility of the White Helmets. Smart as Jo Cox was, it appears that she had been taken in by the media promotion of the White Helmets. If the documentation that I have presented was to be taken seriously, how would the NDP now proceed to extricate itself from this self-inflicted White Helmets debacle? It would seem to me that the honourable and principled thing to do would be to retract its request to support the nomination of the White Helmets for the Nobel Peace Prize, and to honestly explain the reason for the retraction. Because this is such an important matter and something that the Canadian public should be made aware of, I am taking the liberty of having this published as an “open letter to the NDP.” Moreover, I am forwarding this letter to Stéphane Dion, our Minister of Foreign Affairs, to alert him to the folly of acting on the NDP’s request regarding the While Helmets.